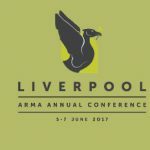 Following the ARMA conference last week, we asked Dr John Rogers, Director of Research & Innovation Services for his reflections ahead of the insights from the #StirARMA17 team. There is no doubt that we live in uncertain times. Brexit, a hung parliament, the formation of UK Research and Innovation, a shifting balance of power in the global research order, and a populist anti-intellectualism that permeates policy making; the list goes on. Research is a long-run endeavour. Uncertainty and rapid change do not necessarily create the best environment in which it can flourish. And yet, with change comes opportunity for those who seek it. Much has been made in organisational behaviour research of the different reaction to change, uncertainty and threat between those of us who react like hedgehogs and those like foxes. Both are valid responses. A tight, prickly defensive ball has ridden out many a storm and universities have proven themselves remarkably resilient down through the centuries. Yet the inquisitive nature of the fox, rummaging through leaves blown by winds of change in search of something interesting or tasty, seems to me more attuned to the research process. I have recently had two great opportunities to reflect on this. First, the University of Stirling was delighted to host one of the residential workshops for this year’s Scottish Crucible programme. I was privileged to be given the chance to take part in a panel discussion on research policy and strategy with the programme participants who, collectively, represent the next generation of research leaders in Scotland’s universities. Sure, there were anxieties about restrictions on researcher mobility, availability of funding, and autonomy of research enquiry. Yet there was an undiminished enthusiasm for the pursuit of knowledge, made all the sharper by the interdisciplinary and challenge-based approach that pervaded the group. Research solves problems, and as a society we certainly have no shortage of those! Then last week I attended the Annual Conference of the Association of Research Managers and Administrators (ARMA), our national professional organisation, of which I am the Deputy Chair. Almost 700 colleagues from across the UK and the globe freely sharing our knowledge, expertise, experiences, concerns and questions in order to enhance the support we can provide for researchers in our organisations. In such a complex and challenging environment, excellent research can only be developed and sustained through partnership between outstanding academic and outstanding professional services colleagues. We have been giving a great deal of thought as Directors of ARMA over recent months about how to enhance the value we offer to our members, in order to ensure we continue to help them develop and maintain the very best professional practice. It was wonderful to see the benefits of that in action throughout the Conference. I should perhaps explain the Highland Cow. The next time ARMA gathers for Conference will be in Edinburgh, June 4-7 2018 in Edinburgh, as hosts to the International Congress of Research Management Societies. We will be “Promoting Global Research Management, Supporting Global Research Challenges” and we hope to be joined by up to 1000 colleagues from across the world. 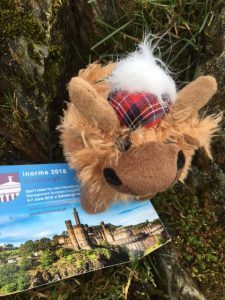 Thanks to our friends in Marketing Edinburgh we have a mascot for INORMS, Hamish the Highland Cow. He travels everywhere with me now as we promote the fantastic professional development opportunity that Congress offers. We are always exhorted to take something away from Conference that we can draw on to help us when we get back to the day job. My take home is a profound reinforcement of my belief in the value of networks. They build resilience, personally, organisationally and across peer communities. They are fundamental to effective partnership approaches. Mine is full of colleagues who I am proud to call friends. And I realise that it’s hard to make friends if you’re a hedgehog, tucked up in your safe but lonely little ball. So, however uncertain and scary the world around us may be, get out there. Build your networks. Make your friends.